The motor faceplates are shown below. The 'hatching' is invisible button for toggling the Auto/Manual selection. The 'Start' , 'Stop' buttons are shown in Black when the motor is in Manual mode. ( They are pressable at any time but only have any effect when in Manual mode ). The same is true of the Reset, this is only 'Blacked' when the motor is in Alarm - but is actually selectable at any time. 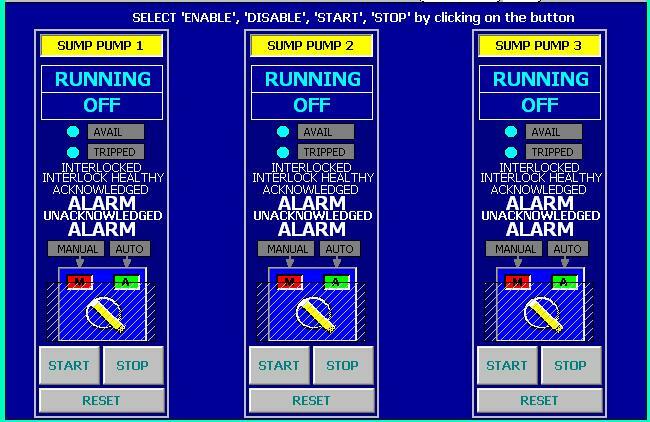 Prior to any resetting the Alarms can be Acknowledged ( Klaxon silenced ) from the Alarm page. Just as the Valve Faceplates there is subliminal information presented to the user with regard to the output to the motor - see the Valve Faceplates for a description of this subliminal information.